Meet the new Joes! Back when I was a teenage Marvel Zombie, I actually bought Marvel Age, the all-house-ad comic, every month. Somehow I missed this issue, and I’m bummed that I did, since I also missed the oddly colored (and named) new Joes inside. Hot Spot? Hot Spot evidently an early/alternate name for Sci-Fi, but Hedge-Hopper?? 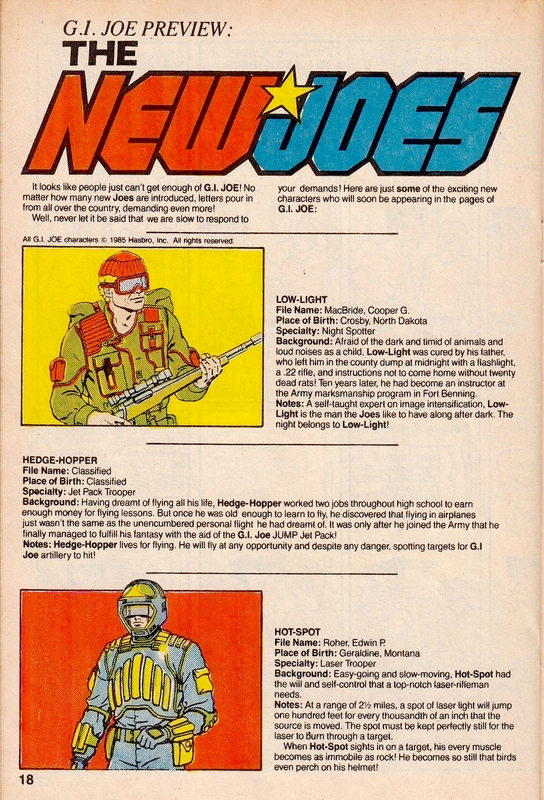 I wonder if whatever Hedge-Hopper was going to be eventually became Starduster? Hedge Hopper likely became Starduster. The Hot Spot name is odd. But, the blue and yellow coloring makes him straight out of Brazil. I, too, was a geek who read and bought Marvel Age each month. Though, I did find a good number of comics I might otherwise have never read through it. I was digging through my boxes of ’80’s comics a year or so ago and couldn’t believe all the obscure titles that I thought were great, but were very short lived. Though, I did find the first 20 issues or so of the ‘Nam. Those heavily influenced my Joe world and were still pretty interesting reading today. I remember getting this issue and being so excited for the ’86 Joes that were coming. As I got the figures, I’d go back and compare them to the artwork to see the differences. It would have been awesome if Hasbro had done a comic pack based on the appearances of these characters in this issue. 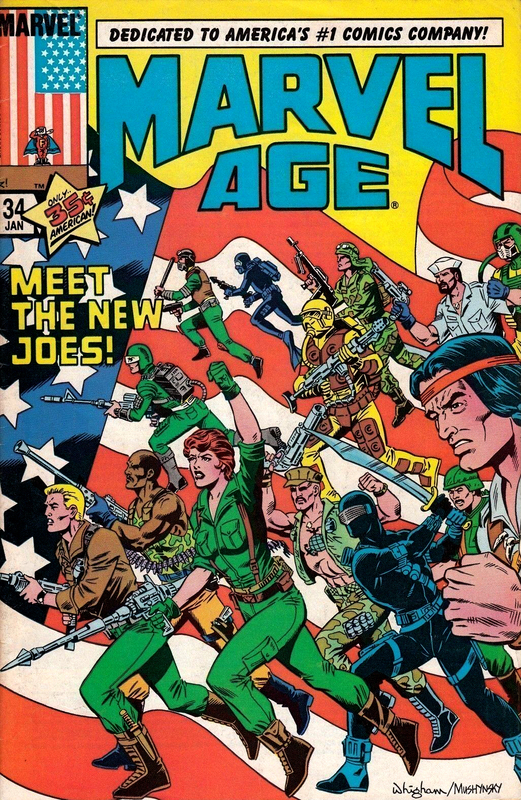 I believe there were other Marvel Age’s that featured Joes. But, they didn’t have the trove of pre-production info that this issue had. I agree, this would’ve made an excellent comic pack! Hedge-Hopper is a great code name for a Joe. Yeah, Hedge-Hopper seems like he became Starduster. Hot Spot? Well, that was used for the name of a Transformer from 1986, the oddly colored pale blue fire truck who led the Protectobots combiner team. Yeah. I always wonder why they chose that blue color, instead of red, or maybe yellow, or that lime looking color. Or maybe white with red stripes on the sides, so it would have match perfectly with the other Protectobots in the set. I do not think that we, the kids from the 1980’s, were that dumb to confuse Hot Spot with Inferno. After all, it says Protectobot Leader Hot Spot on the front of the boxes. I’ve seen pics of pale blue fire truck-like vehicles from Japan. One was some kind of riot/crowd control vehicle (not that Japan would see those used much). That feels like one of the more intriguing mysteries of TF G1. Thirty five cents for a comic book in January of 1986? And even if it wasn’t a comic book, still, that price is insanely cheap. Even for that time. Marvel Age was always cheap since it was mostly an advertisement for upcoming Marvel titles, etc. My local comic shop often gave them away if you bought a few comics. That was how I came to even know of it. It was tossed into my bag after buying my weekly releases. Sci-Fi is Seymour P. Fine , while Hot-Spot is Edwin P. Roher. The birthplace remains the same.